Conceal the slots on any Elfa Standard or Upright with our exclusive Elfa Standard Covers. Made of a flexible material, you can cut the covers to any length of Standard or Upright. Simply cut, insert and you're done. The flexible, matte-finish design of these covers make them simple to install. How to you cut these? Are there any tips for cutting these so that they look integrated? Is it hard to cut them while they are on the standard, i.e. if i decide to add a shelf? We recommend using a sharp pair of scissors, start at the base and roll upward. Cut where you meet a shelf and continue above. Cut away from the standard. 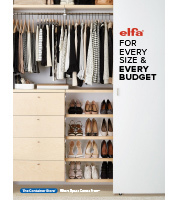 My closet is already built with closetmaid standards and uprights &ndash; is this Elfa cover compatible? Our elfa Standard &amp; Upright Cover is designed specifically for use with our elfa Easy Hang Standards and freestanding Uprights. Compatibility with other shelving systems is purely coincidental. Hi, What colors is this product made in? Our elfa Standard &amp; Upright Cover is available in the platinum shown here as well as in white (shown below). Will this work on the Elfa Freestanding Unit? I&rsquo;m wanting to make a small desk using the 3 foot Elfa Freestanding Unit. Will this work to cover those rails or only works with the Easy Hang and/or Standard styles? Yes, the covers would work on the freestanding uprights as well. Looking to use for a slightly different purpose, so curious about that. Our Elfa Standard &amp; Upright Cover is approximately 15/16&quot; wide and fits our 1&quot; wide Elfa Standards &amp; Uprights.